Data Gestures is a title of my final CIID project. It's a very busy period for me so I'm publishing only a small info now. This mobile application is a result of exploration of mobile gestural interfaces for personal data mining. By providing means both for collecting and visualizing data on the go this software tries to assist it's user in deep understanding of patterns emerging in his everyday life. Every day is a stream of small actions and decisions that we make, from getting out of the bed in the morning to choosing what to buy for the dinner. Separately they might seem irrelevant but gathered together and put into right context might give a whole new insight into our life. This project is trying to answer how to design a mobile application that would assist us in collecting and visualizing this data. Proposed application is focused mainly on money spending of the user. We can add items that we buy and assign them to several categories. That data if carefully tracked it can provide us with information about things like eating habits or when put together with data from other sources it can give impression of overall quality of his life. Interface of the application allows us also to filter the data or search for specific information. 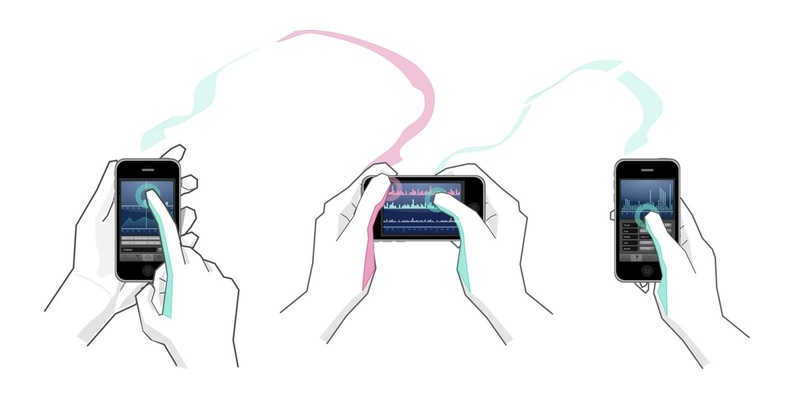 Taking small screen size and gestural interface as a challenge Data Gestures project is moving away from data visualization paradigms known from desktop computing. Because of using multitouch input personal data mining becomes playful and useful at the same time. Buy being able to perform all this operation on the go and having dedicated interface tracking becomes easier. Data visualization available all the time with us (as long as we have mobile phone) is another incentive for gathering even more data hopefully influencing future decisions for a better balanced life.